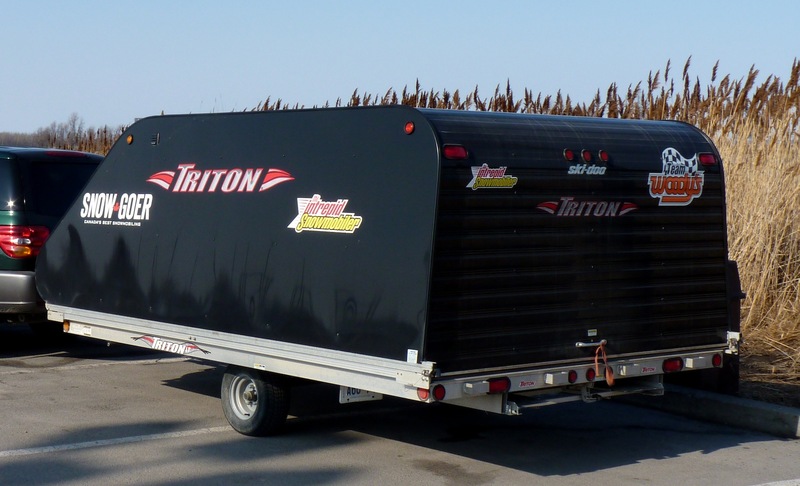 Why should you check out this Triton TC118 Snowmobile Trailers product review? With trailers, you get what you pay for and buying cheap is more likely to leave you stranded by the side of the road than enjoying your snowmobile tour destination. On the other hand, an all-aluminium Triton Trailer will likely last 15 years or more if taken care of and stored properly, and not overloaded. That’s why I’ve been happily towing my two snow machines on a lightweight Triton Elite Model 12R-101 open snowmobile trailer. I added a 2KF 4X4 aluminium coverall to keep the snowmobiles clean and covered. This easy towing, clamshell style combo transported my snowmobiles side-by-side at an affordable cost. It comes with both tilt bed and removable loading ramp capabilities. But Triton rep Paul McNichol persuaded me to try their TC8’ Wide Series Trailer (model TC118) and now I’m hooked. Although somewhat similar in appearance to my Elites, the Triton TC118 is a hybrid. It takes trailering snowmobiles to the next level and costs a bit more. But unlike an Elite with its separately assembled components, the TC118 comes from the Triton factory as a fully framed, totally integrated, fully enclosed and assembled unit. This hybrid construction is sturdier and more durable. That’s why it’s the preferred choice of riders that do a lot of towing over a lot of years on their various snowmobile tours. Loading and unloading are a breeze. That rear door doubles as a loading ramp. Just drop the spring-assisted door and drive out (or in) on. The ski guides mounted on the ramp surface and the inside walls of the trailer make lining up the snow machines easy to get their positioning right first time every time. This is more difficult to achieve on a clamshell model. There, you have to manoeuvre each snowmobile so that its outer ski doesn’t hit the support arms mounted inside the trailer bed. Throughout a very cold and snowy winter, my TC118 rear door always opened (and closed) easily. This enables me to move snowmobiles on or off within seconds. And for security-conscious folks like me, the heavy-duty fasteners on that rear door lock up tight to make sleds hard to steal. What’s more, the walk-in enclosure provides a decent 165 cm (65”) of headroom. So I didn’t have to duck while riding in or out. I could also move around inside without feeling like a giant in a kids’ playhouse. Plus, there’s good interior lighting and room inside to mount a spare on the trailer wall so it’s also protected, clean and safer from theft. Meanwhile, the large, lockable front access door makes it easy to reach inside. So adjusting the vinyl coated tie-down bars equipped with Triton’s Sur-Lock system or storing some gear is easy. This front door is positioned low enough that that I could easily climb inside from the front if necessary. 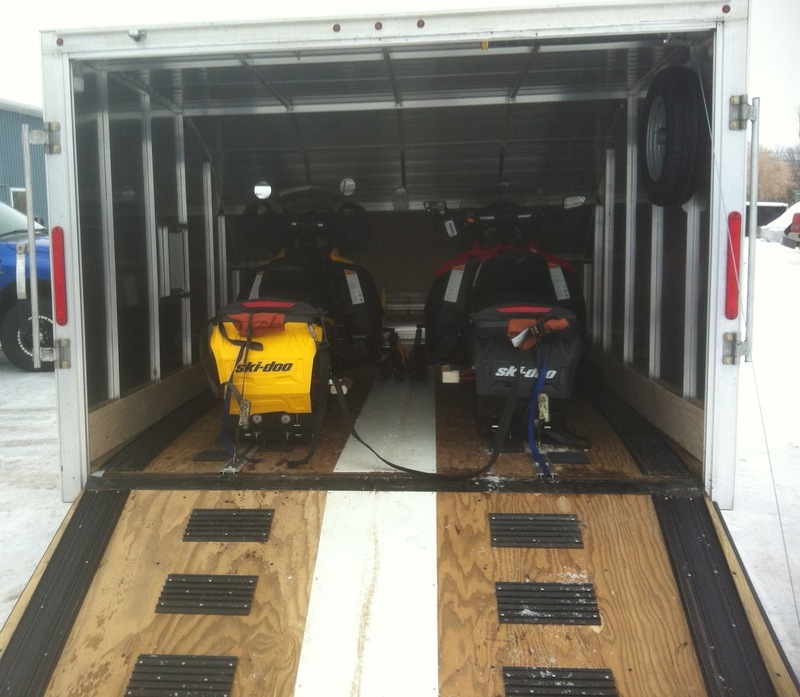 One of the first questions I asked Paul was how to gas up snowmobiles on this fully enclosed trailer. With the Elite clamshell, fuelling was as simple as raising the coverall for side access to each snow machine’s tank. But the TC118 has solid sidewalls. No problem. Paul showed me a lockable, side fuel door accessory big enough to pull a gas nozzle through. Every fuel hose I encountered would reach the tanks of both sleds through this fuel door. Speaking of fuel, Paul warned me that my tow vehicle could use 10 to 15% more of it pulling a fully loaded TC118. The trailer is slightly heavier than an Elite and not quite as aerodynamic. Although its new “hip style” roof does improve wind drag. 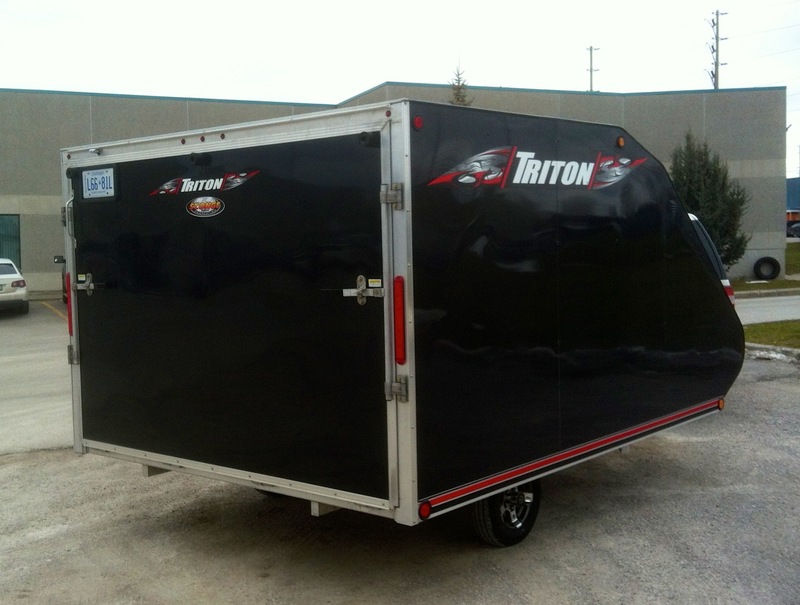 That said, like every other Triton Trailer I’ve had, the TC118 is rust-proof and tows like a dream. It tracks straight, true and very smooth, with no jerking or bouncing, thanks to its torsion axle. If fuel conservation is a big issue for you, look at Triton’s TC167 model. It’s a narrower and longer version of the hybrid TC118. It has the same great features and benefits. But it transports two snow machines staggered, one slightly ahead of the other (instead of side by side). This more streamlined trailer configuration is not only more economical gas-wise, it’s also easier to see around it in your rear view mirrors. My only drawback with the TC167 is not having parking space at either home or cottage long enough to handle or turn this 16 footer. Too bad, because buddies that have one say it’s their favourite Triton Trailer. Suffice it to say that whether you choose a Triton Elite, TC118 or TC167, you’ll be getting more than your money’s worth and a lifetime of towing value. Triton also makes some great trailer accessories. Check ‘em all out and use their handy dealer locator to shop for one near you!